Negotiations between the United States and the European Union to forge an ambitious Transatlantic Trade and Investment Partnership (TTIP) started in July 2013. If successful, the deal would cover more than 40% of global GDP and account for large shares of world trade and foreign direct investment. The EU-US trade relationship is already the biggest in the world. Traded goods and services between the two partners are worth €2 billion daily. Brussels and Washington have set an ambitious goal of completing negotiations by the end of 2015. But the path to reach an acceptable deal is not without hurdles. Citizens all over Europe are petitioning against TTIP and CETA, the newly agreed Comprehensive Economic and Trade Agreement with Canada. Campaigners oppose the deal because of several critical issues, but first and foremost for the investor-state dispute settlement (ISDS) and rules on regulatory cooperation that pose a threat to democracy and the rule of law. “We want to prevent employment, social, environmental, privacy and consumer standards from being lowered and public services (such as water) and cultural assets from being deregulated in non-transparent negotiations. The ECI supports an alternative trade and investment policy in the EU,” they say. Because of rising criticism, Europe and the United States have reached a standoff in the TTIP negotiations, over ISDS and the Commission won’t decide whether to include it until the “final phase of the negotiations” with the US. “There are some fears, some misconceptions, some myths and we want to show that is an important agreement that will benefit citizens, consumers, businesses, the economy on both side of the Atlantic—and many of the fears are not well founded,” European Commissioner Home Affairs Commissioner Cecilia Malmstöm said. If TTIP comes to fruition, it will be the biggest bilateral trade deal ever negotiated, resulting in millions of euros of savings for companies and creating hundreds of thousands of jobs. An EU-commissioned assessment of the potential impact of TTIP by the London-based Centre for Economic Policy Research suggested the EU economy could benefit to the tune of €199bn a year — or €545 extra in the pockets of every family of four in the EU. Similarly, a US family would do even better from the deal, raking in an extra €655 a year. Top sectors for trade in goods for the EU were machinery and transport equipment (some €71 billion of imports and €104 billion of exports), followed by chemicals (roughly €41 billion of imports and €62 billion of exports). The US was the EU’s top partner for trade in commercial services, with its imports reaching €138.4 billion (around 29% of total EU imports) and its exports €143.9 billion (around 24% of total EU exports). In total, the commercial exchanges of goods and services across the Atlantic average almost €2 billion per day. In 2008, before the crisis, around 5 million jobs across the EU were supported by exports of goods and services to the US market. In 2011, US companies invested around €150 billion in the EU and EU firms some €123 billion in the US. In the same year, the US stock of investments in the EU reached over €1.3 trillion and the total of EU stock of investments in US over €1.4 trillion. Furthermore, even if EU-US tariffs are generally low, their removal would have a positive impact on economic growth and jobs and getting rid of non-tariff barriers and red tape would equate goods 10%-20% cheaper, the report found. But numbers are not all. Some take as an example the North American Free Trade Agreement (NAFTA) signed by Canada, the US, and Mexico in 1994, which they say failed to produce the sort of rewards that had been promised. We were promised huge boosts in jobs and what we saw was exactly the opposite in the United States, said Celeste Drake, a trade and globalisation specialist at the AFL-CIO, the largest labour federation in the United States. Not a win-win and not a lose-lose, more of a mixed picture as some sources highlight the positives. The United States has added 25 million net new jobs since 1994. The government’s Index of Real Manufacturing Output increased from 84.3 in the first quarter of 1994 to 119.5 in the first quarter of 2014. Manufacturing workers also earn much more now than they did when NAFTA was passed. Real wages in Mexico have also risen 30% and poverty and CO2 emission have declined. Branded recently as Juncker’s birthday headache, the legal provision, often included within investment treaties between two states, offers public and private sectors recourse to arbitration with the states which have signed the treaty if they allegedly breach it. Supporters believe such clauses guarantee the terms of treaties, since they offer an independent resolution mechanism for parties who did not sign the treaty. The European Commission even said that ISDS would help to standardize the level of protection for businesses across EU’s member states. But critics say there is no need for arbitration between Europe and the United States, as the two partners have well-developed and equally mature judicial systems. Arbitration is needed instead with countries where the local courts are not reliable. “ISDS is like a supreme court of the world, but it doesn’t have judges, and you don’t know who they are and you never heard of it. It’s only there to protect foreign investors,” said Gus Van Harten, associate professor of law at the Osgoode Hall Law School in Toronto, has studied the Investor-State Dispute Scheme for 15 years. Arbitration is carried out by a number of specialised bodies, proceedings are usually conducted in private, and often result in a settlement between the parties, rather than leading to formal tribunal decisions. Opponents of the ISDS clause have emphasised that they believe arbitrators have a vested interest in pleasing investors, and that investor-state arbitration has a built-in pro-investor bias. Since arbitrators are effectively “judges for hire” and depend on their appointments for their fees “in a system where only the investors can bring claims, this creates a strong incentive to side with them – as investor-friendly rulings pave the way for more claims, appointments and income in the future,” according to Corporate Europe Observatory (CEO), a campaign group. The United Nations Conference on Trade and Development (UNCTAD) noted in a study that of the 247 concluded cases known by the end of 2013, around 43% were decided in the state’s favour and 31% in favour of the investor. The rest (26%) were settled. There has been no ISDS case between the United States and an EU-15 country, but a handful of cases between US investors and those new member states which joined the EU in 2004. A way out of this deadlocked debate could be setting up an international court. “In international law, it is fairly rare to allow a private actor to sue a country. But it does happen sometimes, and in Europe that happens with the European Court of Human Rights, the European Court of Justice,” argued professor Van Harten. Another option, suggested by UNCTAD, is tailoring the existing system through individual international investment agreements to promote consistency. Some countries are already pursuing procedural innovations including setting time limits for bringing claims, increasing the contracting parties’ role in interpreting the treaty to avoid legal interpretations that go beyond the original intent, and establishing a mechanism for consolidation of claims. The European Consumers’ Organisation stressed that the level of attention attracted by TTIP’s inclusion of a special arbitration system for foreign investors is fully justified. “Our courts have a longstanding reputation for fairness and investments between the EU and US have flourished without this mechanism. Conceding special rights to companies and risk reducing governmental readiness to protect consumers are nonsensical,” said Monique Goyens, director general of The European Consumer Organisation (BEUC) and EU co-chair of the TACD. Whatever the alternatives, maintaining ISDS in TTIP might turn into a mind-boggling exercise, with some countries blocking the deal. In November 2014, France said and Germany opposed the inclusion of ISDS in the agreement. >>Read: French government will not sign TTIP agreement in 2015. Because TTIP is not a conventional trade and investment agreement, stakeholders have demanded a more open and transparent debate. After months of heated debates over the balance between highest possible transparency and necessary confidentiality, Commissioner Malmström decided to publish more EU negotiating texts and to give broader access to other documents on on-going talks to a wider group of parliamentarians and stakeholders. All MEPs were given full access to the reading room-a facility started under former Trade Commissioner Karel De Gucht, to allow a selected number of parliamentarians to consult the negotiating documents. Malmström’s move was welcomed across the board. Even the European Ombudsman, Emily O’Reilly, who opened an investigation in July 2014, asking the Commission to be more transparent on the proceedings of the talks, said she was delighted that finally the EU executive had taken the concerns of citizens, civil society organisations and MEPs seriously. Despite the need for common sense, TTIP faces strong opposition fueled by mistrust. In 2014, protesters took to the streets of many European cities. Protest groups claimed that big corporations are dictating European policy, while the voices of citizens are not heard. Some observers fear that the mounting dissent could turn TTIP into ACTA, the anti-piracy treaty rejected by the European Parliament in the summer of 2012. But both the Commission and US officials have refused any comparison between ACTA and TTIP. “These negotiations have nothing to do with ACTA,” said in a recent interview, US Ambassador Anthony Gardner. “We will do more in terms of reaching out to civil society members and small-to-medium-sized businesses, and framing the debate in language that people can understand, to avoid any repeat of ACTA,” he added. To rescue TTIP and restore confidence in the deal, some are flagging the geostrategic nature of the the partnership. Talking just about the enourmous economic benefits of the deal is focusing on the tree and not the forest, they say. “TTIP is a gigantic geostrategic opportunity,” German Economic Affairs Minister Sigmar Gabriel said late last year. “The deal is not only about free trade in a strict sense, but also about the EU and the US setting common standards for global trade. On the US side, we hear the same. “We need this deal to help solidify further the transatlantic alliance, to provide an economic equivalent to NATO, and to set the rules of world trade before others do it for us. There are many reasons why this agreement is not only important, it is vital,” said the US ambassador to the EU. To make this aspect even more relevant, last December, Federica Mogherini, the EU foreign affairs chief, pushed for the inclusion of an energy chapter in TTIP, during talks she had with US Secretary of State John Kerry. Diversifying routes and supplies of gas is vital to reduce the EU’s dependence on Russian natural gas. About 30% of the EU’s annual needs are supplied by Russia through Ukraine. In 2009, Russia turned off the taps, causing shortages in the EU. Arguments in favour of TTIP are very much linked to cutting costs, eliminating tariffs, simplifying customs procedures and an overall reduction of regulatory barriers. According to the European Commission, as much as 80% of the total potential gains could come from cutting costs imposed by duplicative bureaucracy. It is useful to bear in mind that the benefits will not be limited to the EU and the US only. There will be a spillover effect to the rest of the world, as EU and US exports would increase by over €33 billion and €80 billion respectively. Ludwig Willisch, president BMW of North America, provides an example. To understand TTIP, he says, you can think of a bumper on a car. The US and European economies have different regulations when it comes to the front bumper of automobiles, Willisch explained. That means that a car made with a EU front bumper can't be sold in the United States. "In some cases, we must design, engineer and manufacture the same vehicle differently to satisfy varying safety and environmental regulations," Willisch said. TTIP would either standardize regulations for the bumper and many other products or declare that regulations between the EU and the US are compatible. Then it would eliminate the 10% tariff that exists now to import US-made cars into EU countries and the 2.5% tariff on EU automobiles imported into the United States. Take another SME example. Ferno-based Rizoma, which makes and markets motorbike components and accessories. It exports to more than 30 countries – with just one plant and approximately 60 employees. There are 20 million SMEs in the European Union – including 3.8 million in Italy –and 28 million in the United States. In the EU, 99% of businesses are SMEs, and they account for two thirds of all private sector jobs – including 85% of net new jobs between 2002 and 2010. In Italy, they provide paycheques to eight in ten of the country’s employees. “We must leverage TTIP to cut down the very real -- and very costly – regulatory barriers to trade. And the stakes in engaging SMEs are obvious in a few numbers,” said Cindy Miller is the President of UPS Europe. Regulatory cooperation: Win-win or Loose-loose? The European Commission published on 10 February an initial proposal on regulatory cooperation, featuring high the setting up of a Regulatory Cooperation Body (RCB). According to some experts, greater regulatory convergence between the EU and the US could result in efficiency gains and GDP growth.Others, however, fear that regulatory coherence would effectively limit policy space and sideline the public and civil organisations, the Corporate Europe Observatory said in a statement last week. Business and NGOs are divided over TTIP regulatory cooperation, especially in areas where the two partners believe to have better legislation, such as chemicals for the EU and financial services for the US. 33 NGOs signed a joint declaration of their “deep concern and firm opposition” to such cooperation on rules, arguing it will drive down standards in areas such as chemicals, food standards and financial services. Let’s take chemicals. The EU and US regulate chemicals in different ways. European regulation requires that all chemicals sold in Europe be registered with the European Chemicals Agency. US requirements are much less strict. This means that we are far from proposing harmonisation and mutual recognition. But there is scope for cooperation in four areas, which would cut down costs and boost efficiency for both regulators and industries, said Lena Perenius, Executive director of CEFIC, the European Chemical Industry Council. “Enhanced regulatory cooperation between the EU and US is the best route,” she said. The Commission believes that if the regulators could agree to coordinate their safety assessments of the same chemicals – assessing the same products at the same time and exchanging information – companies wouldn’t have to repeat some tests, saving them money and time. “There are clear benefits for reaching a common scientific basis for decision-making. If regulators start with the same understanding of the effects of chemicals, even if we have different systems, we up the chances – in the long run – of narrowing the differences in regulatory decisions,” Perenius added, stressing that could either work in the form of a joint scientific committee with scientists from the EU and US or on an ad-hoc basis for particular issues. Burden sharing will also improve implementation of chemicals regulation as well as aligning classification and labeling. This is one example, others can be put in place in other sectors. In the long run, progress will largely be determined by the level of ambition in the negotiations as a whole. Another concern is that the protection of regional products could slacken under TTIP. “If we want to seize the opportunity of free trade with the giant American market, we can no longer protect every sausage and every cheese as being a specialty,” Germany’s Agriculture Minister Christian Schmidt told the German press earlier this year. The same concern is echoed across the continent. Under EU law, protected regional specialities can only be sold under their traditional names if they were actually made in the region. For example, around 296 Italian products are on the EU's protected status list of 1,100 foods, alongside delicacies including Parmesan, Gorgonzola, Prosciutto and Pecorino and Cantuccini Toscani. France has 250 products on the list, Germany 98, and Britain 60. Legal protections are enforced in Europe but not in America, where immigrants have taken European food traditions like the Mozzarella cheese, Cornish pasty or Black Forest Ham and made them their own. Fears over surrendering certain protections of regional products are greater than ever. “When Nuremberg, Thuringia, or Black Forest is on the label, that is exactly what should be inside,” demanded former German Agriculture Minister Renate Künast from the Green Party. This conflict has been around for many years. Attempts by the EU to repatriate such names, whether for wines, cheeses or meats, have met with resistance. But the issues are not insoluble, say experts. The agreement on lists of generic names in the US, backed up by evidence that the consumer does in fact regard these as common names, should not be impossible, said Tim Josling and Stefan Tangerman in their report on Agriculture and Food in TTIP. Generic names (GIs) cannot, under WTO rules, be protected as GIs. Only a handful of such true generics exist, and cause a disproportionate amount of concern: names such as “parma ham” and “parmesan cheese” are commercially valuable to some North American firms. According to the CEPS experts, producers in Europe should consider purchasing the rights to those names if they feel that their own market is being eroded. Other agriculture and food issues in TTIP will largely be determined by the level of ambition in the negotiations as a whole, the experts said, noting that if modest, a low-level agreement could include some limited commitments on agricultural market access and food regulations. The EU is not going to change its food legislation because of TTIP, said the lead negotiator Ignacio Garcia Bercero. That means that GMOs can be marketed in the EU only once they have been authorised, and beef from the USA would be marketable in Europe only if it is hormone free, he added. The EU stance on GMOs, a regulatory issue that has created major tensions between the US and the EU in the past, will not be reversed. The President of the new European Commission installed in November 2014, Jean Claude Juncker, has already announced that he intends to confirm and strengthen the power of national governments to ban the planting of GM crops in their member states, and US negotiators seem to have understood that this is a matter that must be left off the table. Another issue that will likely be remain off the table is financial services. Despite support from both US and EU industry bodies for its inclusion, the EU and US are at loggerheads over financial services in TTIP. US Ambassador to the EU Anthony Gardner and former EU Trade Commissioner Karel de Gucht clashed over the issue in Brussels last year. De Gucht said an agreement over broad principles in a free trade agreement for financial services would ensure that EU and US regulation would be finalised in a consistent manner. “We are of the opinion that financial services should be part of TTIP, obviously the US side is very reluctant to do so,” he said. In the case of banks, for example, the US has said its Dodd-Frank Act is sufficient. Dodd-Frank is the US interpretation of the global Basel III standards for banks. The US argues Dodd-Frank is moving at a faster pace than its EU equivalent, the Capital Requirements Directive IV. Basel III is a set of reforms for banks to strengthen their regulation, supervision and risk management. It was endorsed by the G20 in November 2010. Another area that will likely demand greater clarity is public procurement. The EU and the US (except for 13 of the 50 individual States) have both signed up to the WTO Agreement on Government Procurement (GPA), currently being revised. This deal will likely be the base for the related chapter in TTIP. This said, public procurement is not a federal competence in the US. The EU is particularly worried about the existing Buy America clauses, which excludes EU companies from participating in tenders. The US has also a preferential regime for national SMEs. According to the EU, only 32% (€178 billion) of the US procurement market is open for EU businesses, under the revised GPA commitments, while 85% of public tenders in the EU are open to US suppliers. "Too often we see public procurement being used as an instrument to favour local companies. It is obviously a tempting political instrument, but on the negative side it leads to increased public spending and reduced competition," Karsten Dybvad, Chief executive at the Confederation of Danish Industry, is reported to have said. Eliminating local content requirements, he added, would be not only be good for transatlantic trade, but also more importantly it could be used as a common model for future free trade agreements with other trading partners. However, there are concern that liberalising public procurement markets, combined with ISDS could restrain the power of national government to decide on the way they provide public services—like water for example. 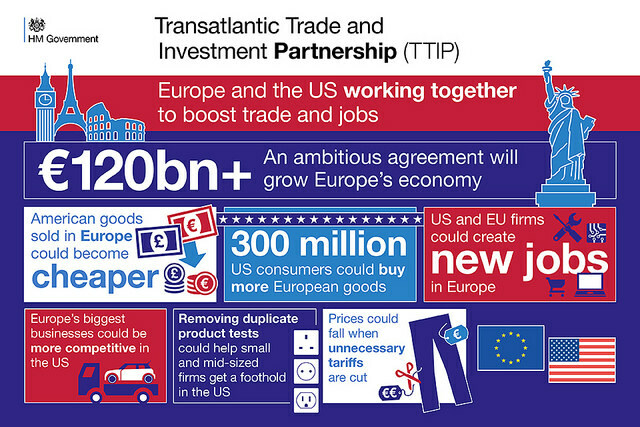 TTIP has been touted as a way to revitalise global trade, economic growth and international competitiveness. But experts say that despite the best intention the EU and the US have not managed to involve their main trading partners. “This approach, understandable given the complexity of the negotiations, could produce a bilateral agreement that is difficult to multilateralise,” said Sinan Ülgen, who gives a series of recommendations. To genuinely solve the enlargement problem, Ülgen favours, among others, a specific provision for accession to be included in the TTIP agreement and the creation of a TTIP caucus or a joint platform to directly interact with Washington and Brussels. A study conducted by EU-Brazil shows that if Brazil stays out of TTIP, will cause further losses in the country’s trade balance. The negative impact can be even more significant in sectoral GDP and trade flows. “Trade policy runs on two sentiments: profit and fear. In the past decades, far too many countries, especially big emerging economies, have comfortably avoided new liberalization in the WTO because they haven’t feared the alternative. Yet if the alternative to global liberalization is TTIP (and TPP), then the cost of frustrating global cooperation will be bigger for intransigent countries,” Fredrik Erixon, director of the European Centre for International Political Economy said. Indeed, the inclusion in TTIP of investment, competition, and public procurement — issues that emerging and developing countries are reluctant to address in trade negotiations — several developing countries have also questioned whether transatlantic partners are attempting to impose norms and regulations on which they have no input. According to German Marshall Fund experts, concerns are strong in Africa. The EU’s share of the African market has been steadily declining and the United States is struggling to gain a larger economic foothold on that continent. Speaking to EURACTIV about a potential EU-US trade deal, expert in transatlantic relations Joseph Quinlan said that TTIP “is the deepest more ambitious, trade agreement that we have ever seen”. “Trade, more investment, capital flow, movement of people, data creates growth, prosperity and opportunities,” Quinlan argued. "Better access to the current TTIP negotiations for citizens and MEPs is a real and long overdue step. The innovations presented for more transparency in the TTIP mark a successful restart for the European Commission and especially for Cecilia Malmström?,” said Daniel Caspary MEP, the EPP Group Spokesman on International Trade. “It basically makes it possible for everyone to learn about the current status of the TTIP. This is of crucial importance because from now on, European or American citizens can no longer be manipulated by alarmists. In these negotiations, transparency is also an instrument that allows a rational debate to prevail over bias propaganda, facts to prevail over emotions," stressed Caspary. Caspary emphasised the need to strike the right balance between maximum transparency and necessary confidentiality. "The new Trade Commissioner has turned into action what the European Parliament has been requesting for a long time and where her predecessor Karel de Gucht failed. Our shared goal must be the reduction of worries and myths - this can only happen through more transparency. But let’s not forget that the TTIP is still an ongoing negotiation that will always require a degree of confidentiality," he concluded. “The importance of ISDS is blown out of proportion by its supporters, some of whom may suffer from a degree of strategic blindness: it is simply not going to be the end of the world if ISDS clauses are eliminated, circumscribed, remodeled or limited in scope as suggested above,” said MEP Sorin Moisa. “On the contrary, it is a major strategic mistake to sacrifice carefully negotiated new generation trade agreements on the altar of ISDS, if public opinion does not accept it. It is a threat to the already frail legitimacy of trade negotiations and to the further economic integration of the Atlantic world that is simply not worth pursuing,” he added. “TTIP could also become the economic equivalent of NATO. Just as the transatlantic alliance serves as a security umbrella for its members, so TTIP could serve as an umbrella for rules-based market capitalism,” said Daniel Fiott from the Institute for European Studies at the Vrije Universiteit Brussel and a senior editor of European Geostrategy. S&D MEP Bernd Lange, who chairs the parliamentary trade committee, said, "The publication of the negotiation documents is a result of our demands for more transparency in the talks with the United States. The road ahead is still long, and we will continue to encourage the Commission to demonstrate a maximum of transparency. In addition, it must be clear that the demand for more transparency does not stop at the TTIP negotiations, but also applies to all negotiations in which the EU is engaged." The Committee of the Regions warned that the trade agreement's impact on local and regional authorities has not been sufficiently clarified, especially with regards to public procurement and public services. Regions and cities acknowledge the growth potential of the TTIP, especially for European small and medium-sized enterprises (SMEs) which are the engine of job creation in Europe. Nevertheless they are concerned by the EU-US partnership's implications at the local and regional level and demand to be involved in the negotiations. CoR rapporteur Markus Töns, Member of the North Rhine-Westphalia Landtag, highlights in the soon to be adopted opinion that a number of potential risks threatening the balance between the need to foster competition and innovation in the EU, and the commitment to ensure social inclusion, local self-government and public control on services of general interest. Bulgaria expects the Transatlantic Trade and Investment Partnership (TTIP) to help boost trade with the US, according to Economy Minister Bozhidar Lukarski. “Improving access to the US market for Bulgarian goods, services, and public procurement will contribute substantially to stimulating economic growth, innovation, and employment in Bulgaria, as well as the protection of intellectual property rights,” Lukarski declared, as cited by the BGNES news agency. Lukarski said that Bulgaria expects TTIP to have a positive impact on sectoral competitiveness and productivity. 8 January 2015: European Commission has uploaded new documents concerning the trade negotiations. 5 February 2015: 2nd annual EU-US conference on the Transatlantic Trade and Investment Partnership, Where now for the EU-US trade deal? European Policy Centre Event : ISDS & TTIP - Must-have or deal breaker? FoodDrinkEurope: Europe’s Food Manufacturers welcome EU – USA trade talks. Orgalime (European Engineering Industries Association): TTIP Postion? BBC: Why can't this car be sold in the US? Agree completely – CETA and TTIP are therefore bound to not even reach the middle, never mind final scrutiny phase – they are both doomed. And that is as it should be. The NON shareholders of the world are NOT DUMMIES; they are ‘dummied’ by misinformation that is trying to convince them that the NON shareholders will benefit from the recent influx of trade arrangements as much as the SHAREHOLDERS. That’s a lie; a pretty big one, a whopper. It’s misleading & fraudulent.Trade will always exist with, or, without treaties; it’s just a matter of finding a buyer & a seller. Regardless, any hiccups in overcharging, or, price fixing is passed along to the consumer until a cheaper supplier under prices the transgressors. The paper trail of their illegal collusions can be tracked down & prosecuted depending upon the seriousness of the funding of any investigators. However, shareholders don’t like investing in a steadily, but, modestly growing enterprises.They want to feel the exhilaration of the chase for the big score. They want more bang for their buck & some ‘home-runs’ at the expense of someone on the outside. And, that’s where the present ‘arrangements’ in the recent treaties with their secret (‘Death-Star-Chamber’) tribunals give the SHAREHOLDERS & their corporate leaders the power to take the NON shareholders tax dollars as their prize while providing zero dividends, or, financial returns to the NON shareholders. It’s robbery that is being legitimized by the creation of the SHAREHOLDERS’ own jurisdiction that has not so surprisingly determined in advance that the NON shareholders are guilty in abscentia of every charge & all costs & then some for ‘good’ measure, that come before the tribunals with no access to the tribunals to question the procedures, the findings, the determination of the amounts of the alleged damages, or, the means for appealing the decisions. It is not dissimilar to the benefactors of the unregulated shenanigans that precipitated Wall St. meltdown claiming that the harmless, NON shareholders should pay for the cost cleaning up the mess. The chairman of the Federal Reserve, Alan Greenspan, et al, admits that he was wrong, retires from the Reserve & moves on. In conclusion, the salesmen of these recent trade & investment ‘arrangements’ do not want the harmless NON shareholders/taxpayers to ever understand that there is only a finite amount of value in the world & if your salary increase is not attached to the amount that the SHAREHOLDERS & their corporate leaders are in the process of making via their present treaty ‘arrangements’, then it demonstrate how much your value is shrinking by way of the SHAREHOLDERS taking your tax dollars. The amount inversely proportionate to the amount that they are taking from the many & splitting with the few. The faster the salesmen move the process along via secret, political bipartisan arrangements the less likely the NON shareholders will have time to get their evidence before our traditional & accountable judges. Buyer Beware of the ‘Fast Trackers’ & make sure that they keep their hands in their own pockets; they are ‘schadenfreudes’ (Germ; exalting in the misfortunes of others). 2) ‘The MERKEL (Chancellor of Germany) Letter; To Sue, or, Be Sued’? Sorry to interfere with your seaming rant – but are you for or against CETA & TTIP? Yes, but it is the high degree of ‘control’ that is the primary factor here. You take away control and place t predominantly in the court of big powerful all devouring business and you have a recipe for complete abuse. Just look what that did to the global financial markets in 2008 when the thing crashed, as too much power and ‘control’ was in the hands of banking criminals. Business love profit more than people and in a fight, the people would take 2nd place. Therefore the TTIP has to have a balanced system where the rich and powerful cannot use their enormous clout to get what they want. For if we do not put in the right ‘controls’ in place, they will certainly take advantage as they always do. We shall if we don’t watch out create a constant litigation monster where the corporation v. the people is continual and increasing as the big business sees through the TTIP that they can manipulate the system to their own ends. Don’t tell me that it would not happen as I have been around long enough at 67 years of age to see that corporates will have a go wherever to further there own ends. Indeed corporate power is so powerful that even governments bow to their whims behind closed doors. Who could blame them when according to Forbes a mere 2,000 of then (Global 2000) controlled 51% of all global trade last year or around $36 trillion in nominal terms. Leaving 49% for the rest of us. TTIP and CETA are for dummies! No one in their right mind wants more control given to large US and EU corporations at the expense of local democracy. The attempt of EURACTIV to one-sidedly support the sinister CETA and TTIP agreements is deserves contempt and is yet another despicable attempt of the EU and its bureaucracy to lull EU citizenry to go to sleep. The point is that people in the EU are not asleep and are now actively rising against these anti-democratic and illegitimate so-called ‘free-trade’ agreements. Well have you just now figured out that is what Euractiv is and does? Cecilia Malmstöm is an intellectual vacuum which is why she is so popular with the Americans. She is clearly not up to the job of really applying some objective scrutiny to these faulty so-called ‘free-trade’ agreements. Her pronouncements seem to have been written in Washington. Her efforts to make CETA & TTIP palatable are like trying to put lipstick on a pig – completely useless, counterproductive but funny! Retail arguments about “growth and jobs” are sermon our officials don’t believe in themselves. There are instruments for harmonising countries with the EU-28 rules, association agreements. Here the US proposes a bad deal for Europe and the Commission negotiates in a very weak way. At least US industry defends their interest abroad. Whenever you get mutual recognition the result is that the weaker standard prevails, and the higher standard cannot get improved anymore by the domestic legislature. I don’t think 28 countries should grant a single nation the power to prevent it from meaningful regulation, or let US industries de facto censor EU Commission legislative proposals.